Owing to the wrongdoings affiliated with evils similar to black money, an honest but ferocious police officer returns as the Deputy Commissioner of Police with the prospect of wiping out injustice. In Goa, Pritam meets his love Geeta after many years. They decide to get married but the feud between their respective children creates tension in their marriage. A man is sandwiched between his over possessive wife and a police inspector, where he is suspected for adultery and murder. A couple's married life is turned upside down when a distant relative overstay in their home. A con man uncovers a deadly secret and must save his lady love, the small-town locals and the little girl who insists she's his daughter, from the mob. Superb screen play -> at least it won't make u bore in any part. Marathi atmosphere -> Its really nice to here Marathi in Hindi films (Remember old Hindi movies with at least few dialogues in Marathi) ... Feel's great ! Prakash Raj -> villainous role is superb, Got a nice role & dialogues, even better than Wanted. 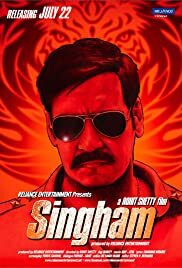 Bad: Songs (Except title song - Singham) are not so good. Which was the plus point for other 3 movies.